US News and World Report annually evaluates schools through sophisticated metrics and recognize the best high schools in the United States. In their 2015 recognition, LAAAE earned a Bronze Medal. 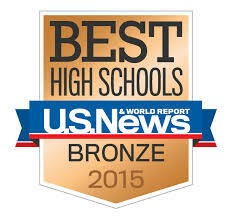 For more information on our school’s recognition, visit http://www.usnews.com/education/best-high-schools/california/districts/los-angeles-unf/los-angeles-academy-of-arts–enterprise-charter-91743.